This season, the ADPRO Sports Training Center Fieldhouse has been reimagined and rebranded to serve as a youth and family-oriented area called Club Buffalo Bills. With new elements and a reimagined footprint, the space will be the gameday interactive destination for kids and families. The National Guard will have a table set up to learn more. Come visit Bills team partners in front of the Bills Store for your chance to play games, win prizes and more! The below listed partners will have a display area within the Team Store parking lot off Abbot Road for fans entering the stadium near New Era Gate 4 and Tim Hortons Gate 5. Live Music: Singing and Dancing Choir will be performing holiday music starting at 11:30 a.m.
Dinosaur BBQ: Try the official BBQ of the Buffalo Bills! The smokehouse will be fired up and ready to serve their award winning BBQ. A representative from Designated Drivers of Buffalo will be present at the Designated Drivers signup kiosk in the northwest corner of the stadium throughout the game. Have your propane equipment inspected and serviced by a qualified propane technician to make sure everything is running as safely and efficiently as possible. Never try to repair equipment yourself or use equipment that is in need of repair. Bills head coach Rex Ryan has lobbied the Buffalo fan base more than once this season to support the team for home games and the fans have come through in a big way. Unfortunately the team’s home record hasn’t reflected that support. Buffalo has a 1-3 home mark, but that has not dissuaded Ryan’s belief that home field can still provide an edge for his team this Sunday. Chief among them LeSean McCoy and Karlos Williams, who will be looking to make Buffalo’s run game the identity of their offense. Also expected to return to the lineup this week are RT Seantrel Henderson, RG John Miller and possible WR Sammy Watkins. After a successful ride-along day with Buffalo Bill, Marcell Dareus, the partnership with Safelite AutoGlass continues! 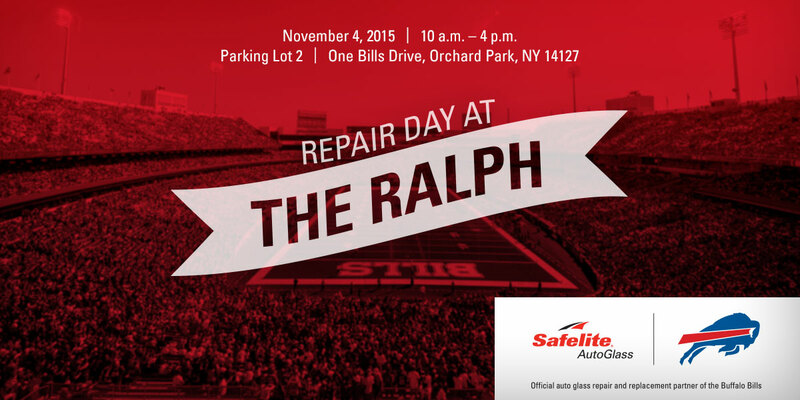 This time the Safelite team will be coming out to Bills territory. On Wednesday, November 4, Safelite AutoGlass will be offering windshield repairs in the Ralph Wilson Stadium Lot 2 Parking Lot. From 10 a.m. to 4 p.m., you’ll be able to get your windshields repaired right outside of the Ralph. Plus, be sure to stop by The Bills Store before or after your repair. If you mention Windshield Repair Day, you’ll get 20% off store merchandise on purchases over $50! The Bills have been busy this week. Next week free agency opens when more additions figure to be made. Let’s get to your questions from email at AskChris@bills.nfl.net and on Twitter @ChrisBrownBills. Any chance Trent Cole wants to join Shady in Buffalo? Any shot Bills go for that? CB: If you’re thinking of signing Cole to replace Jerry Hughes I don’t know that you’re getting comparable value. So if saving money is the aim you could sign Cole, who will be 33 in October and he could serve the team in a rotational role as a pass rusher, perhaps platooning with Manny Lawson much like Hughes and Lawson did in 2013. Cole still has gas left in the tank, but a full-time role might be a lot to ask. CB: The Bills would still like to get Hughes locked up long term, but it’s my belief that after Justin Houston was franchised in Kansas City and Jason Pierre-Paul was franchised in New York that the Hughes camp looked at the free agent market and likely felt they had an opportunity to be the most coveted pass rusher on the market. Hughes doesn’t have the off the field issues of Greg Hardy and he doesn’t have the injury history of Brian Orakpo. There isn’t a free agent pass rusher with more sacks over the past two seasons than Hughes’ 20. So once Houston and Pierre-Paul were franchised it wouldn’t surprise me if Hughes’ asking price suddenly increased. If getting the most money he can possibly get trumps the best possible fit for him to maximize his abilities on the field (Buffalo) that’s his prerogative. We’ll see where it goes between now and March 10th. With most of the NFL Teams going to the lighter/quicker defenses because the NFL is more of a passing league, do you think that Rex’s “ground and pound” could give the Bills Offense an advantage if they shore up the OL. I also feel with this philosophy EJ Manuel will be an improved QB. He will have more windows to throw into once defenses start cheating in the box by playing the run. There were parts of EJ’s game that were good. Two of which were the 2 min offense and the ability to keep plays alive in the pocket when he didn’t have restrictions put on him. Your thoughts? CB: I think your point is an astute one. San Francisco took that approach under Jim Harbaugh and Bills offensive coordinator Greg Roman back in 2011. As most teams were building lighter and faster lines in the trenches the 49ers bulked up and punched everybody in the teeth. It’s a big reason why their run game was so successful. I do believe such an approach can work again because the trend in the league is still gravitating toward passing. But if you don’t know what you have at quarterback the ground and pound approach knowing you have a good defense is the best route to take. Love your work in keeping a long time Bills fan (50 yrs plus) in touch. Grey Cup QB’s? Just wondering. CB: The Bills absolutely scout the CFL. In fact they were one of the first teams in pursuit of former CFL’er Cameron Wake, but he chose to sign with Miami. Buffalo covers any and all avenues where potential NFL talent can be uncovered. Thank you for providing continuous coverage of the Buffalo Bills throughout the offseason as it helps us remain interested in the team for 365 days a year! My question has to do with a recent comment made by Commissioner Roger Goodell. While I am aware of the uncertainty that comes with Ralph Wilson Stadium and its future, his comment puzzled me to an extent. Mr. Goodell mentioned that while the Ralph is loved (by him and by many including myself), the stadium cannot compete with the newer parks. Please feel free to correct me, but to my knowledge the Ralph is one of the bigger stadiums in the league, we, for the most part, have not had problems selling out the tickets, and we have made recent upgrades such as video boards, concession stands, and the likes. I understand many newer stadiums and sports economics are designed to cater more towards corporations and the use of Personal Seat Licenses. I’m not sure if the market of Western New York can be said to support the same modern marketing formula as many major cities utilize in the US at this day. WNY is a unique and rock solid fan base quite capable of supporting the Bills and the Sabres on our own. Not suggesting that we wouldn’t benefit from a new park, but what did Mr. Goodell mean? What other “challenges” or shortcomings does the Ralph have in respect to competing with the newer stadiums (that are sometimes smaller than ours and perhaps features not considered in the recent upgrades)? This is where I am a bit lost and hopefully you can shed some light into this confusion. Thank you and Go Bills! CB: You’re not wrong that Ralph Wilson Stadium is one of the larger ones in the league, but regular ticket sales no longer provide the kind of revenue that carry a team’s profits comfortably into the black. It’s the luxury suites and premium seat sales that drive the ticket sales revenue streams. To maximize a stadium’s ability to provide additional revenues NFL owners want more of a focus on the premium seating and luxury suites, which cost more to boost ticket sales revenues ever higher. A few years ago I would agree that Buffalo’s corporate tax base would not be able to sufficiently fill such premium seating, but with the surge in construction downtown, new businesses coming to Buffalo and the new medical campus coming together in the city there could be the corporate base required to support such an endeavor right around the time when the team and the city make a final determination as to what’s best concerning a future home for the Bills. Ralph Wilson Stadium will play host to the Section VI high school football championship games on November 8 and 9. Advance Game Tickets can be purchased for $7.00 at each participating high school, or tickets may be purchased at the Ralph Wilson Stadium ticket office during normal business hours. On the day of the games, ticket office lines at Ralph Wilson Stadium will be exceedingly long due to the high demand so we highly recommend purchasing tickets in advance at the participating schools. Day of Game Tickets will be available for $7.00 on the day of the game at the Ralph Wilson Stadium ticket office, which is located next to the Healthy Zone Fieldhouse. Please allow sufficient time to enter the gates after purchasing tickets at the ticket office. Parking is complimentary and parking lots open two hours prior to the start of the first game on each day. Stadium gates and day of game ticket sales are open one hour prior to the start of the first game on each day. All stadium policies and procedures are in effect including no re-entry. No alcohol will be sold. Smoking is not permitted inside Ralph Wilson Stadium. There are no fires permitted anywhere on the stadium grounds. Food and beverage will be available at concession areas inside the stadium. Ticket office and entry gates will close at the start of the fourth quarter of the last game each day. Healthy Zone Fieldhouse: 9:30 am. Indoor tailgate includes vendors and interactive games. Scoreboard Lot C: 10:00 am -12:30 pm Widow Maker (rock cover band) will perform two sets: 10:00 – 10:45 am, 11:00 – 11:45 pm. The tailgate will include interactive inflatable games, appearances by the Jills Cheerleaders and souvenirs from partners. Food and beverage will be for sale. The first 50,000 fans will receive a pink ECMC and ADPRO Sports Yowie® rally band. The Yowie rally band can be worn and used for multiple purposes, including a headband, scarf, wristband, rally towel, neck warmer, etc. Volunteers from Zeta Tau Alpha and the Buffalo Bills Womens’ Association will hand out 15,000 pink BCA ribbons. As a part of the NFL’s month-long Crucial Catch initiative, Sunday’s Billieve game will promote breast cancer awareness through a number of gameday activities, a gate giveaway, player and fan gear, and pink on the field and throughout Ralph Wilson Stadium. Breast cancer survivors will be recognized on the field during a pregame ceremony celebrating their years of survivorship, and two of those survivors will be a part of the commemorative pink game ball delivery. The Akron and Albion 10-11 year old youth football teams of the Niagara Orleans Football Association will scrimmage in pink gear at halftime, mirroring the gear worn by Bills players during the game. Billieve breast cancer awareness merchandise will be sold throughout the stadium with a portion benefitting the fight against breast cancer, as well as pink ribbon cookies sold in the club seating areas, to benefit the ECMC Lifeline Foundation’s Mobile Mammography Coach. The Buffalo Bills are teaming up with Pointstreak 5050 on an innovative platform to raise charitable funds for the Buffalo community and Western New York region through an electronic 50/50 raffle on gamedays at Ralph Wilson Stadium. The Pointstreak 5050 system enables raffle tickets to be sold to fans through mobile sellers utilizing electronic handheld devices, portable printers, and a number of stationary selling terminals around Ralph Wilson Stadium with half the proceeds going to one lucky fan and the other half going to the ECMC Lifeline Foundation. For more information on the Bills 50/50 Raffle please visit http://www.buffalobills.com/5050. For your convenience on game day, the Buffalo Bills and Republic Services Blue Team will be handing out blue recycling bags and black garbage bags to tailgaters to help keep their space clean. Tailgaters are encouraged to fill the bags and leave them at the end of their tailgate for Bills staff to pick up before the end of the game. The Buffalo Bills, in partnership with Designated Drivers of Buffalo, offer an alternative to driving in order to ensure that guests return home safely. Guests who are uncomfortable driving home have access to this unique service by calling (716) 713-7703. Arrangements can be made prior to a game or on game days. Two representatives from Designated Drivers of Buffalo will meet a guest and their party to drive the guest’s home in their own car. This allows guests to return home using a safe method in their own car. For more information, please visit www.designateddriversofbuffalo.com. Thank you for being responsible. Spend $75 and get a Billieve earring or pendant for free. The Bills and the National Football League are committed to creating a safe, clean, comfortable, and friendly environment for all fans, both in the stadium and in the parking lots. Several new Fan Experience Enhancements have been implemented for the 2013 season in an effort to improve the safety and comfort of our fans, and the efficiency of our event operation. LEARN MORE. Scoreboard Lot C: 10:00 am -12:30 pm Karma (rock cover band) will perform two sets: 10:00 – 10:45 am, 11:00 – 11:45 pm. The tailgate will include interactive inflatable games, appearances by the Jills Cheerleaders and souvenirs from partners. Food and beverage will be for sale. The first 50,000 guests through the gate will receive a Time Warner Cable rally towel. Members of the Belle Center will be in the stands as guests of Kiko Alonso and Marcell Dareus. Lucy Candelario, Executive Director of the Belle Center Buffalo will receive the Hispanic Heritage Leadership Award during the pregame festivities. Spend $75 and get a foam finger for free. Bills head coach Doug Marrone has been impressed with the performance of the fans in Ralph Wilson Stadium for the first two games of the regular season. He believes they can provide a lot to a winning effort at home, as was the case Sunday. The challenge now is the first road game for Buffalo under Marrone and his coaching staff. The Bills face the Jets at MetLife Stadium Sunday for a 4:25 pm kickoff. In the wake of the new lease agreement between the Bills, Erie County and New York State was the language contained within it that talked of conducting studies and exploring the feasibility of a new stadium for the team. Bills President and CEO Russ Brandon was asked if there were any developments on that front. Here was his response. Renovations on Ralph Wilson Stadium have already begun, with the initial work focused on the “bones” of the stadium with structural repair and improvements. Free agent LB Nick Barnett, who is visiting with the Bills this weekend, is interacting with Bills fans on twitter as Bills Nation is recruiting him to sign with Buffalo. Barnett gave them credit for their omnipresence on twitter, but has another question. NickBarnett You bills fans are great here on twitter.. How bout in the stadium? Tell him what it’s like at the Ralph on a Sunday Bills fans. With everything else up in the air you can still count on Fan Friday. So here’s the latest installment and keep those questions coming at AskChris@bills.nfl.net. I wanted to email you because a lot of mis-information at times permeates the message boards re: the Bills. With Coach Wannstedt on board, there is a contingent of Bills fans that feel he will be the de-facto Defensive Coodinator making Coach Edwards the DC in name only. I feel that Chan wouldn’t do something like that and would either fire coach Edwards or come out and say that Coach Wannstedt is the guy from day one. CB: As you know Chan Gailey is a straight shooter. His assistants are loyal to him for a reason because they trust him. Naturally every coach at the highest level of football has an ego of some size. I don’t know this, but it’s my belief that Coach Gailey would not have added Dave Wannstedt to his staff if he did not believe in the professionalism of both Wannstedt and defensive coordinator George Edwards. I have to believe those two men met at length prior to the hiring of Wannstedt so Gailey could ensure that Wannstedt and Edwards would be able to work together in achieving the same goal, which is a much improved defense without letting job titles get in the way. Wannstedt is the Assistant Head coach in addition to being the inside linebackers coach. Edwards is the defensive coordinator. It’s as simple as that. Naturally those on the outside are going to speculate that Wannstedt will wield more power because his coaching history is more familiar to fans having been a head coach for two different NFL clubs. Gailey, Edwards and Wannstedt do not look at it that way. Their commitment is to improving the performance of the team and getting more wins, not who has the best solutions in the meeting room. Gailey trusts that this can be a collaborative effort to make the defense better, but Edwards will be calling the plays on Sundays. 1) Not knowing the rules of free agency, it’s hard to know what QB’s will be available. What are your thoughts on Tarvaris Jackson as a back-up/possible quarterback of the future? 2). Steve Johnson had quite the breakout year last year, and that caught most people off guard. Do you have any thoughts on who may be this year’s breakout performers? CB: I think with Jackson having a strong background in the West Coast system that he’ll likely go to a team with that offensive system. Seattle is a likely destination for him since his former quarterbacks coach in Minnesota, Doug Bevell, is running the offense there now. As for a breakout performer, I don’t know that anyone will have the kind of jump in production that we saw from Johnson last season, but players that I believe are on the rise this year for the Bills are Arthur Moats, David Nelson, Torell Troup and Kraig Urbik. Thanks for taking the time to answer our questions each week. 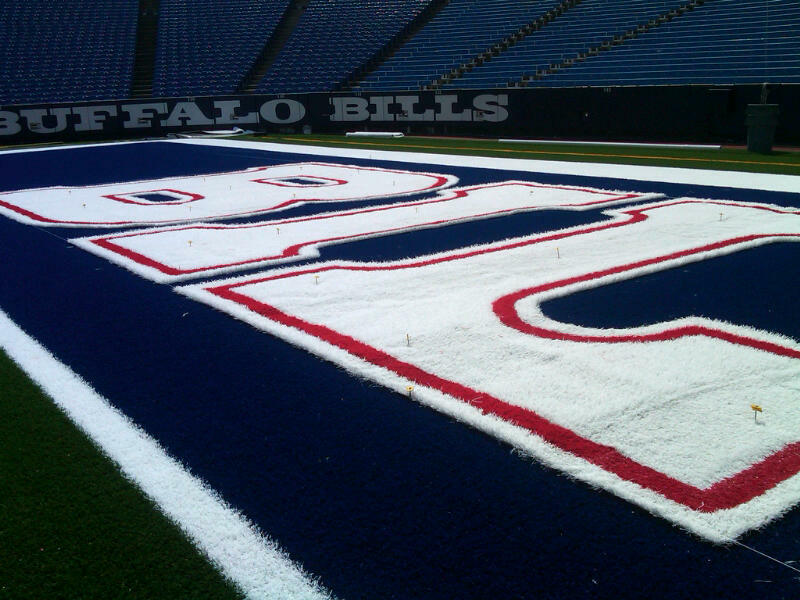 My question for you is: have the Bills announced a new color scheme for the end-zones after the new turf is installed? I personally loved the red end-zones from the 90s. I’m curious if they will change the color or not. CB: For those of you that missed it this week, the end zones are royal blue with white lettering and red lining. Here’s a sample photo of it. First, just wanted to thank you for doing a great job keeping the passionate Buffalo Bills fans constantly updated! I know its way too early to have predictions and start looking at power rankings, but with the lockout just about over, I started looking at some opinions of some “experts” and none have the Bills even in the top twenty teams. They often refer to how the Bills only one four games but I don’t think they realize how many games we COULD have won if we could just close a game. I am very optimistic and have a ton of faith in Gailey and Fitz and truly believe next year we will make a gigantic leap and make the playoffs! Granted were in a very competitive division but I still think we can do it! What are your thoughts for next season? CB: I’ve withheld judgment on the Bills because in this unusual offseason the roster has yet to take shape. There’s a lot of personnel stuff to be settled in a very short period of time. The fact remains however, that they do play in a very competitive division. Granted the Jets roster could change dramatically in light of their cap situation and number of marquee free agents, but this uphill climb in the AFC East will be challenging. In addition the Bills have a very difficult schedule with the NFC East on the slate as well as a much improved AFC West. I’m not trying to dodge you, but I need to see where players like C.J. Spiller, Marcell Dareus, Torell Troup and others are at once they get back in. Young players that are expected to contribute more in year two or as top flight rookies have been the most affected by this offseason in terms of their development. They can greatly impact the success or lack of success of the club this year. With the whole spring workout schedule lost what changes is Chan Gailey going to have to make in preparing for the season? CB: In talking to some of Buffalo’s assistant coaches earlier this offseason, they already had put plans in place to simplify the installation of the playbook in training camp. That likely means less volume, fewer plays etc. I think it’s also possible that play installation could be tied to the framework of preliminary game plans for the first few games of the season. The coaches want to ensure that they can get sound play from their players in the games that count despite the shortened time frame with respect to reps on the field. So repping those plays that they’re likely to run against the likes of Kansas City, Oakland, New England and Cincinnati in the first month of the season seems advisable. And the coaches have had plenty of time to scout those teams off last year’s film. Granted there will be some changes, but I could see that being a part of what’s different in terms of preparation. The Bills new turf is almost complete. Just one more end zone to letter and some other detailing and it’ll be good to go. I’ve gotten many requests from fans via email for a closer shot of the end zone lettering. Here’s one courtesy of the Bills media relations department. 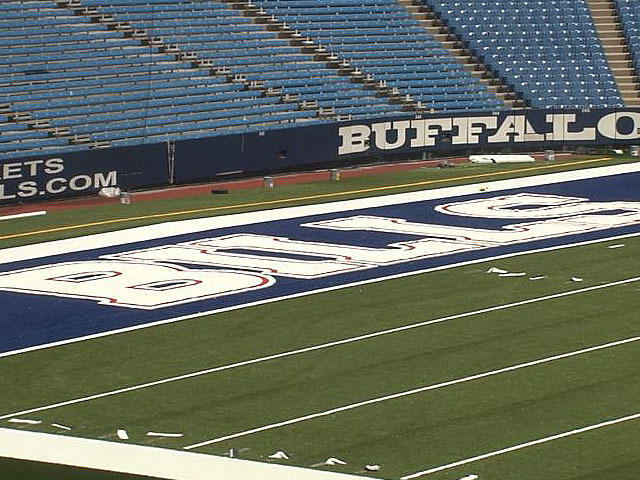 One new end zone at Ralph Wilson Stadium is complete. Second one underway. Here’s a shot of the completed one. Keep in mind, it was a cloudy here earlier in the day in Orchard Park so the hue of the blue end zone might not be wholly accurate in this photo. On a sunny day it’s likely to appear more royal blue than it does in this photo. The new turf going in at Ralph Wilson Stadium is going to have some new elements. Bills CEO Russ Brandon mentioned some of them, which appeared on the Buffalo Bills twitter account. 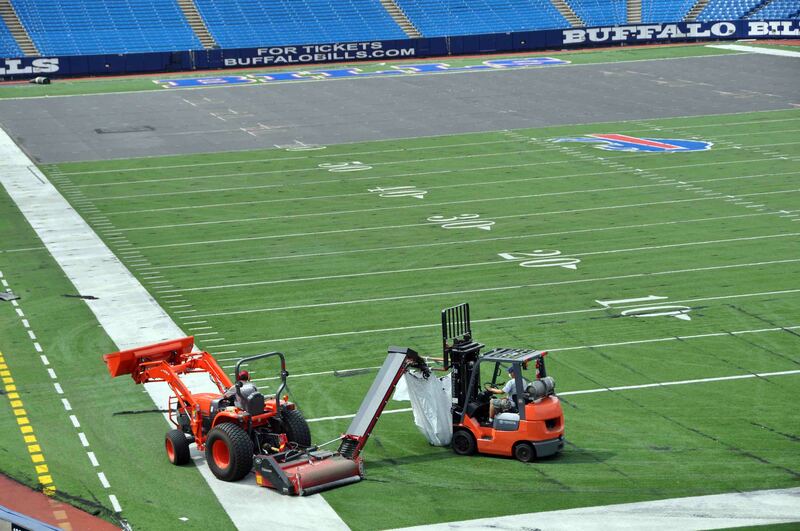 The process of removing the old turf inside Ralph Wilson Stadium has begun. Here’s a photo of the old stuff being removed. It will be replaced by a local company (A-Turf) that will be installing a brand of turf called A-Turf Titan a new synthetic grass surface that allows for better foot release. Hey Bills fans, if you’ve got tickets to any of the remaining home games at the Ralph, you’ll want to read this. The Bills are offering Parking Lot #1, known for some of the Bills top tailgaters, for fans to buy on a first-come first-serve basis. Formerly a cash lot, Lot 1 will now be a permit-only lot beginning with the Bills vs. Detroit Lions game on Sunday, November 14, 2010. No vehicles will be permitted to park in this lot without the proper parking permit. The parking permit for Lot 1 guarantees fans a parking space regardless of when fans arrive, and costs only $20 per game. The newly paved lot is conveniently located right off of Big Tree Road (Route 20A) with easy access to Route 219. The lot offers additional porta-johns, increased security and a fun and safe atmosphere with parking near the Bills Field House and Ralph Wilson Stadium. Season ticket holders were offered the opportunity to purchase parking passes for Lot 1 and the remaining spaces are now available to the public. The change to a permit-only lot is an effort to enhance the traffic flow and improve the game day experience for fans. Interested fans can contact the Bills customer service department at 1-877-BB-TICKS (228-4257) to purchase a permit for any or all of the remaining home games. The Bills are hosting the nationally renowned 14th Annual Drums Along the Waterfront competition at Ralph Wilson Stadium this Sunday, Aug. 8 at 5:30 p.m. Billed as the “Grand Slam of Drum Corps,” The Drums Along the Waterfront is a musical sport featuring the power and precision of the world’s best drum and bugle corps. The event will include the thirteen-time DCI World Champion Blue Devils, five-time DCA Champion Empire Statesmen, and “The Commandant’s Own,” U.S. Marine Drum & Bugle Corps, plus a special tribute to veterans and service members. Tickets for the event are only $22 in advance ($25 on the day of the event) for adults and $10 for kids 12 and under. Students, seniors and military may purchase the tickets for $20. Tickets are on sale now through Ticketmaster at www.ticketmaster.com, by calling (800) 745-3000.